What can Munchables offer my child? Munchables kids' products are perfect not only as fashion accessories, but also for children that chew. Our sensory chewelry provides a safe alternative to chewing on collars, cuffs, fingers. Redirecting chewing to a safer option can increase focus and confidence. We offer necklaces, bracelets, pencil toppers and a wide range of non-chewable sensory fidgets. We have had over 1000 reviews left over the past four years. Numerous parents have found that Munchables are able to help their kids. What if my child doesn't' like their Munchable? What style should I buy? Every child will get a different amount of wear from their Munchable. Mild chewers may never need to worry about replacing their chewelry, while extremely aggressive chewers may be able to destroy their items within days. The style of each item influences their durability. For aggressive chewers, styles such as the Donut or Yummy Gummy Pendants are highly recommended. Every Munchable is made of 100% safe silicone; this means that that the products do not contain dangerous additives, such as BPA, lead and phthalates. When will my order arrive? Orders are sent from Vancouver Island in Western Canada. Most orders arrive within 3-8 business days. Please note. This item is not designed for more aggressive chewers. The protrusions will be easily torn off by some children. 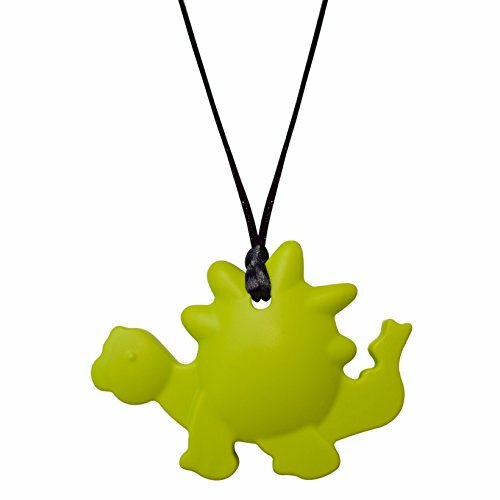 The Dinosaur Pendant is ~6cm by ~8.5cm.